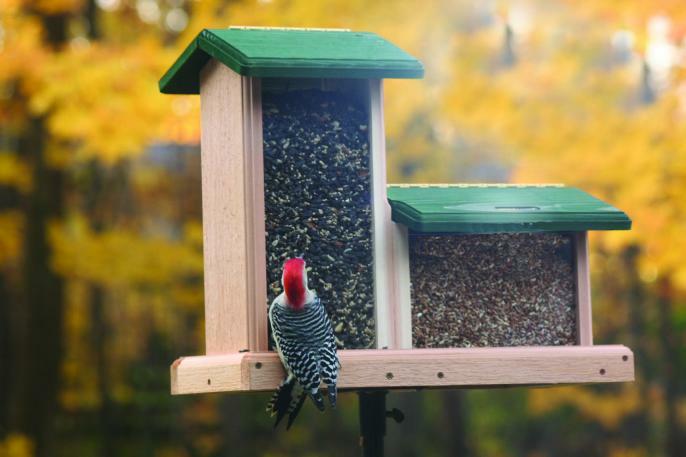 What’s all the frenzy around your tube bird feeder? So what’s the reason behind the increased activity? Because many species are molting their feathers right now, they have an increased need for a steady diet of high quality food. 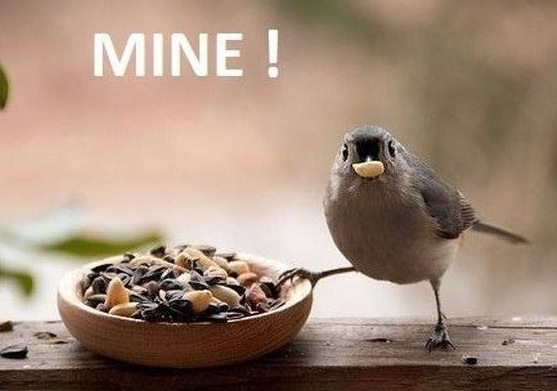 Chickadees, titmice, nuthatches and others are kicking into high gear with hoarding seeds right now too. If you watch some of these birds closely, you’ll see them eating some of the seeds but they will be stashing many more of them under the bark of older trees, and or poking them into holes and cracks in trees and other locations. Seeing empty feeders just goes against our grain 🙁 If birds’ activity has increased at your feeder that it takes filling everyday… it may be a good time for a bigger one? Winter’s not too far off and these resilient resident birds are sure to hang around a dependable food source. This new tube feeder’s a beauty too! At a whopping two feet tall, the large Castella features a venetian bronze finish over steel, with a seed tray for less waste and easy perching. And the killer turret… it adds a magical touch to any garden setting! If the hummingbird buzz and pre migration isn’t enough activity right now, the local butterfly population seems to have exploded! The past few days have provided some mesmerizing views around the garden. 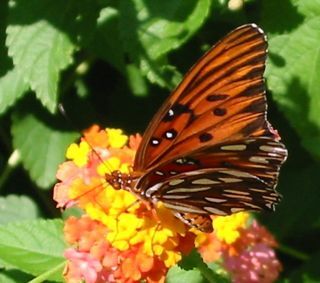 Four species of the jeweled wonders have been spotted flitting around flowering shrubs and plants. 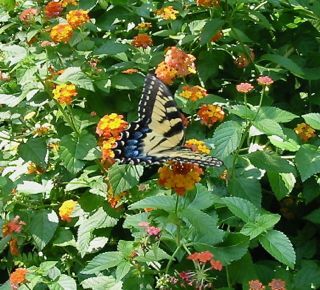 Lantana, butterfly bush and abelia have recently been the most popular of nature’s butterfly feeders. Monarchs and swallowtail butterflies being the most abundant. In past years the leaf misters were especially attractive, but with all the rain this season, they haven’t been employed much. Instead the rains have produced bumper crops of flowers, in turn feeding anyone who pollinates! 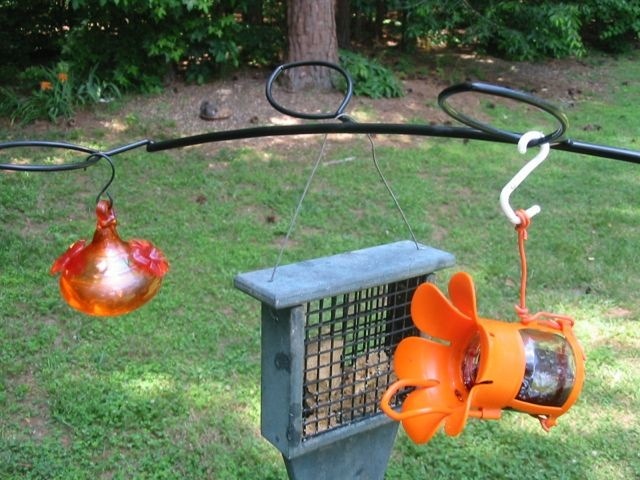 Store-bought butterfly feeders are great, especially the ones with wicks that allow butterflies to feed more naturally (like drawing nectar from flowers). 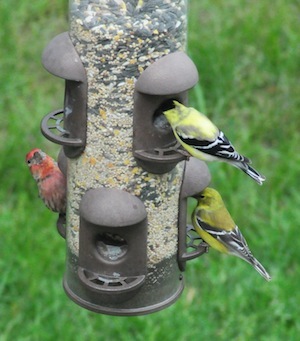 Even a plate of over-ripe fruit chunks may entice, but nothing beats nature’s feeders! In an abandoned parking lot he was spotted selling his wares out of the back of a truck. Due to the sheer height of some his wood birdhouses, it was kinda hard to miss, and pretty obvious something cool was happening. So my friend calls and says “ya gotta come see!” – but I didn’t. It took a few weeks… no months before I actually met up with Karl. Definitely worth the trip down to Marietta Square to see what was cooking with this artist. Birdhouses all over his place; parts, pieces, iron, wood, metal, you name it and Karl was using it to build his houses. His dog Hoover (who guards all the wares left outdoors) was pretty neat too! Always fascinating to see into the mind’s eye of a creative type, probably because of my own art background. Working construction part time, the guy comes across some great salvage stuff. Currently clearing a lot that once hosted a real plantation home, he hit pay dirt… the oak boards were almost one hundred years old-and they looked perfect too. At his place, old hardware from doors and other iron parts sat in a big pile, waiting to be reclaimed for a second life. Wanting to purchase about six wood birdhouses was problematic. – a difficult decision as no two pieces were the same! So I went by their height and closest matching styles. There’s something to be said for using reclaimed materials. In the garden, these vintage style bird homes create a bit of an heirloom atmosphere. Their rustic style is timeless, and oh yeah… these homes are definitely bird-approved too! Hinged back doors for easy nest removal even have a lock to keep birds safe from predator’s paws. The 1.5-inch entrance is perfect for Eastern bluebirds, downy woodpeckers, Carolina wrens and other small to medium sized songbirds. The house is tall (at 38 inches) but a wire nesting shelf sits a few inches above the floor. This helps reduce blowfly and other pest infestation, greatly increasing the chances for successful broods and healthy fledgelings. The ringing bell is functional too… Karl might just need to start signing his work! You can now add additional feeders or even a small hanging bath without adding another garden pole to the landscape. The simple quick-connect system installs in seconds on any one inch standard garden pole. 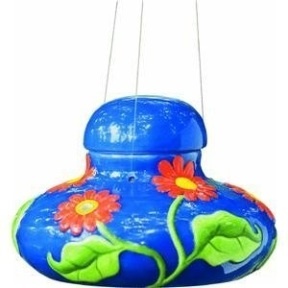 Made in the USA of heavy duty powder coat steel, this cool bird feeder bracket holds up to ten pounds. Ideal for adding a suet or hummingbird feeder, mealworm dish, thistle sock, or even a smaller bird bath to entice feathered friends! 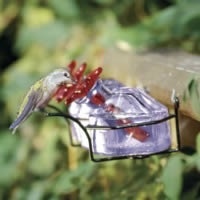 Since variety is the spice of life, expanding offerings on your existing pole is simple with this bird feeder bracket. It lets you change things up with seasons for maximum bird attraction too. Replace fruit & jelly feeders in winter with whole or shelled peanuts, or consider an extra suet feeder to help resident birds with their need for additional fat and calories during frigid weather. Measuring two feet in length, the innovative curved branch design with leaves offers several options for placement of any new items. In no time at all, birds will flock to this new pole hanger to check out their new goodies! Their migration south will soon begin as will the “crazies”! Mobs of them, buzzing, fighting, darting around feeders to stake their claim. Tiny bodies need lots of energy for the trek back to winter breeding grounds in Central and South America, and it’s big attitude when it come to fueling up for the trip. Territorial would be an understatement, the sprites can become pretty fierce and downright possessed around feeders! It’s been a weird season for hummingbirds, many folks report fewer numbers upon their initial arrival, the extended winter weather likely to blame. Fewer (almost none) of the birds’ natural nectar sources were available for their journey northward, possibly causing many to perish. It wasn’t until much later in the season we started seeing more numbers at feeders… and many of them being juveniles. And soon again it will be time to go – the dwindling hours of daylight is what signals their clocks that it’s time. It’s a total myth that leaving feeders out will keep hummingbirds from leaving… Mother Nature tells them otherwise. You can really make a difference in helping these flying jewels by offering as much food, and as many sources as possible. 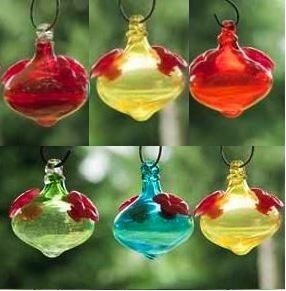 If you haven’t done so in the past, try making your own nectar before the season’s over (you’ll be glad you did). It’s really so very simple: 1 cup plain table sugar to 4 cups water… that’s it! Nothing else in the solution as it’s harmful, no red dye needed. We boil one cup of water just to dissolve the sugar more effectively – add 3 cups of cold and no waiting for it to cool. Store unused nectar in the fridge for up to two weeks. Some say the solution may be made stronger during migration as more sugar equals more fuel. Never stronger than a 1:3 ratio though. 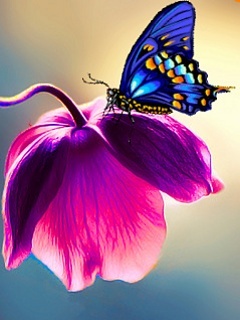 Keep nectar fresh and consider hanging an extra feeder or two so there’s not so much fussing and fighting. Multi-port styles are a good idea as they allow more birds to feed at once… provided they can all get along! Most of the Bird Brain Hummingbird Feeders offer 2-3 ports and some of them are still around. In fact, they’re being manufactured again under a different name – so they must be worth it! The Mini-kins are perfect for this time of year because they come in a set of three and may be placed in separate locations. Again… less fussing and more eating will suit hummingbirds best for their long trip ahead! Although wood is good for birdhouses, it’s not always best for feeders because squirrels chew wood! Over time wood will weather, sometimes nicely-sometimes not depending on the quality. Wood is porous and therefore harbors bacteria and mold… not good for birds. 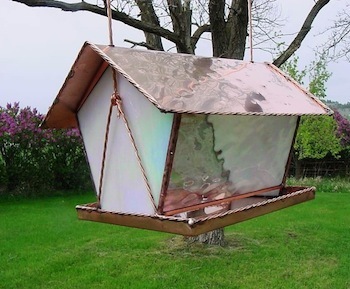 Copper, glass, or recycled plastic provides a slick surface that’s more resistant to bacteria, much easier to clean and way better for the birds. 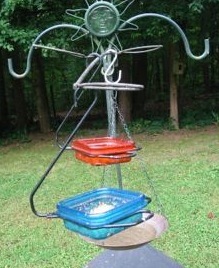 A stained glass bird feeder like this hopper model allows for various seed mixes. It won’t ever fade, warp or rust, and it’s chew-proof by squirrels. 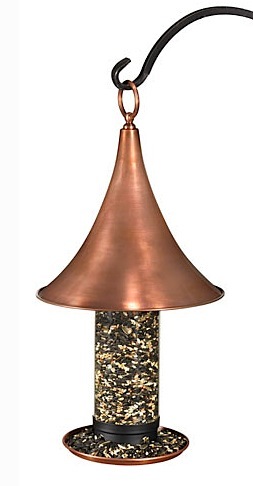 Handcrafted in the USA, it’s available in about eight different colors, and features a hand hammered copper roof. What’s the best kind feeder to get when starting out? It’s simply got to be the one you will maintain. Basic black oil sunflower is a popular seed that many species enjoy. If you don’t care for the hulls or mess below feeders – opt for sunflower hearts or a “no-waste” mix. These cost a little more, but every morsel is consumed, no messy ground waste below feeders! Cheap seed with fillers (like milo and millet) will end up on the ground, and in damp or humid conditions, creates another breeding ground for bacteria and mold. Ground feeding birds like cardinals, towhees and juncos will sift through this junk looking for a bite to eat. Yuck! If the only feeder you’re up to maintaining is a simple bowl, that’s okay too. Just keep it clean and keep food fresh… and they wi ll come! And don’t forget to add a water source, a shallow bowl or plant saucer with fresh water creates a refuge on hot summer days! This past winter it seemed like spring was taking forever. Ease up – too much bird food, we’re going through this stuff like water! Once it warms up the birds will eat less, right? Wrong! It seems we’re going through just as much seed now as we did in when it was cold? Sure a few unwelcome grackles and starlings put a dent in the supply, but omg… seems like bumper crops of cardinals, and chickadees, and titmice, and woodpeckers, and nuthatches, and finches, and well, you get the picture. That’s why it gets me in the gut sometimes when folks say “I don’t feed the birds in summer”. It’s got to be up there with turning the birdbath over for winter. Wild birds are wild indeed, if a food source disappears, they’ll move on to find another. 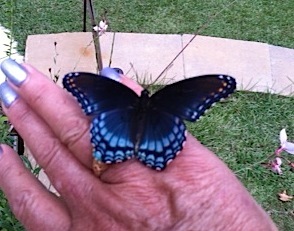 Just seems once you’ve attracted them with feeders or bird baths, it should be a consistent source. Call me the crazy bird lady! Oh yeah, and the whopper of Hopper Bird Feeders? This durable cedar model with ample perching space offers two different seed mixes for maximum bird attraction! A large seven quart capacity and two removable seed trays makes it easy to clean and fill. Great quality, made in the USA makes it last too!